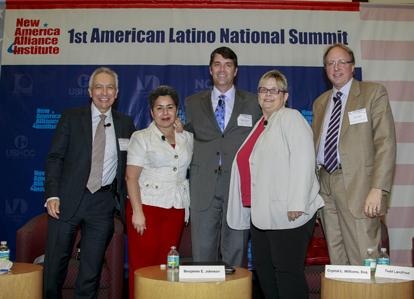 MIAMI, FL - The New America Alliance (NAA) launched its 1st American Latino National Summit on Monday, September 24 at Miami Dade College's Wolfson Campus in downtown Miami, Florida. 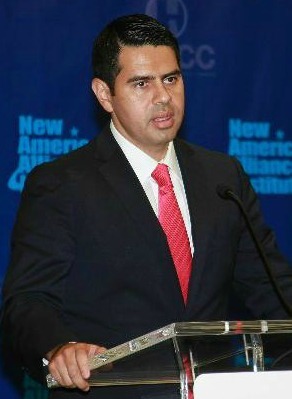 The purpose of the National Summit is twofold: first, to define to the nation who we are as American Latinos by elucidating where we stand and what our contributions are to our country in terms of economic capital, human capital and political capital; and second, to articulate cohesive positions on the major issues of our times as they relate to the American Latino community and our nation, with an overarching emphasis on the economic case for Latino advancement. 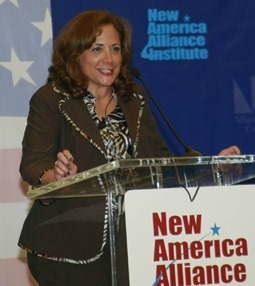 The American Latino Agenda Report 2012, presented by New America Alliance (NAA) and Miami Dade College (MDC), commemorated the launch of this 1st biennial National Summit. 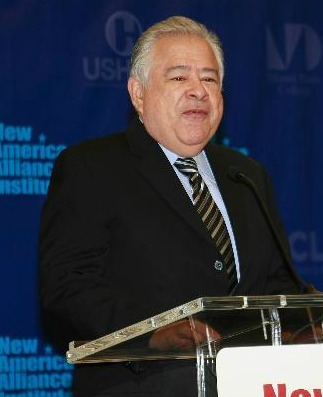 The Report was presented with content contributions from Univision, Hispanic Association on Corporate Responsibility, NALEO Educational Fund, Immigration Policy Center, and Edwin Gould Foundation. 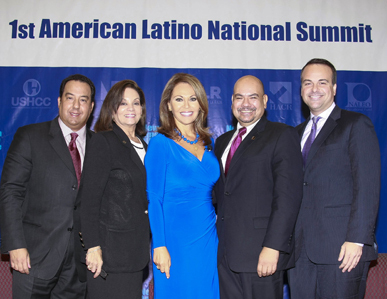 We brought together the most prominent, respected and eloquent Latino and other leaders to emphasize the economic case for American Latino advancement, including wealth building, education, immigration, civic participation and American Latino leadership across sectors. 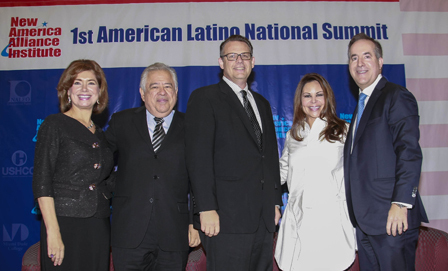 The opening of the American Latino National Summit began with remarks by NAA Inc and NAA Institute Vice Chair Ana Maria Fernandez Haar, NAA Co-Founder The Honorable Henry Cisneros, NAA Inc Chair of the Board The Honorable Roel Campos, and NAA Institute Chair of the Board Moctesuma Esparza. 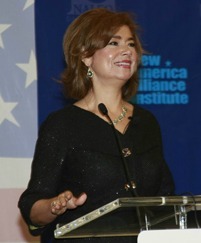 Opening remarks presented by Ana Maria Fernandez Haar, NAA Inc and NAA Institute Vice Chair of the Board, Managing Partner, Victoriana, LLC; The Honorable Henry Cisneros, NAA Co-Founder, Executive Chairman, CityView; The Honorable Roel C. Campos, Chair of the Board, NAA Inc, Board Member, NAA Institute, Partner, Locke Lord LLP; Moctesuma Esparza, Chair of the Board, NAA Institute, Board Member, NAA Inc, Chief Executive Officer, Maya Cinemas North America, Inc. 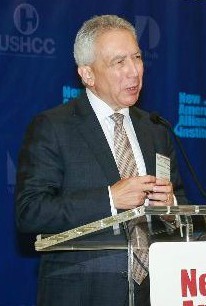 Opening remarks for the first session, The American Latino Agenda: A National Imperative, were given by Cesar Conde, President of Univision Networks. 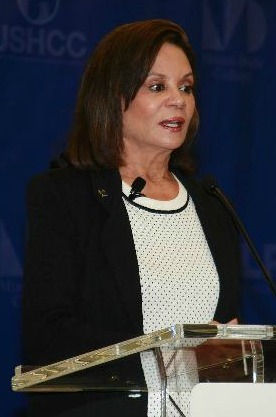 This Opening Panel, including the Summit's co-hosting organizations and moderated by Maria Elena Salinas of Univision, set the tone and direction for the day by discussing key American Latino and national issues on economic advancement, corporate and political leadership, the Latino vote, immigration, and education. 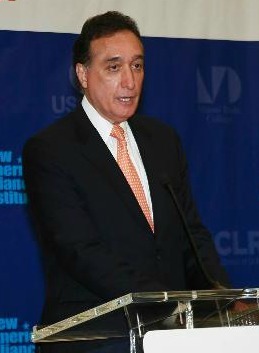 Remarks on behalf of Governor Mitt Romney were given by The Honorable Carlos Gutierrez, 35th United States Secretary of Commerce, who was introduced by NAA Member Juan A. Sabater, Managing Director of Valor Equity Partners. As the economy takes center stage during the Presidential campaign, job creation and spurring the economy are at the top of the candidates' agendas. Many American Latino entrepreneurs have seen their innovation and hard work pay off and many will continue to contribute in strengthening the U.S. economy by creating new jobs and increasing revenue. 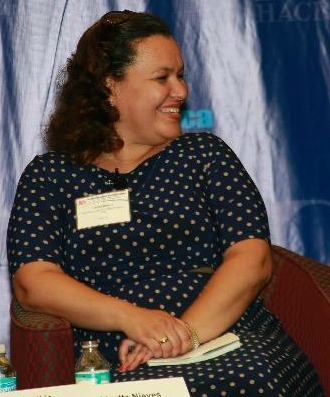 The American Latino community boasts inspiring tales of business success, such as the stories of our distinguished American Latino Entrepreneurs Lead Job Creation & Wealth Building panelists, with extraordinary accounts of American Latino success, working to lift up generations of their own family, as well as the families working within their businesses, and giving back to the progress of their communities. Latinos are experiencing an explosive growth in the U.S. Yet, in terms of attaining college degrees, they lag behind. Unless we can increase the size of the pipeline of young Latinos going to college, America will lose its competitive economic edge. The Education Session, America's New Economic Engine: Ensuring Young Latinos Have the Education Attainment They Need to Carry Our Nation Forward, focused on an informative discussion to examine the impact demographic data and the cost of Latino drop outs as well as the upside to our economy when Latinos persist to college and career attainment. 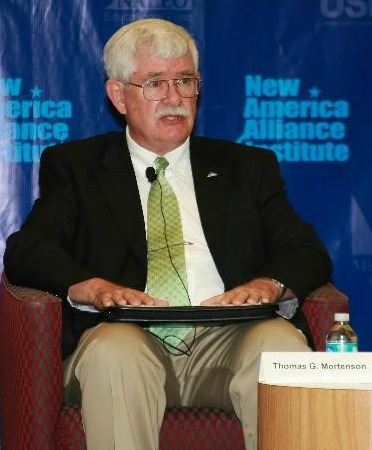 During the Immigration Session, Immigration - A Vehicle for America's Economic Prosperity, distinguished panelists discussed the immigration debate, the contributions and productivity immigrants bring to our country, and defeating the negative stereotype made about Latinos and immigrants. 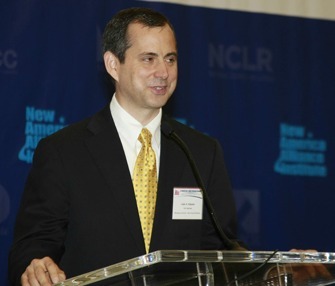 As outlined in the American Latino Agenda Report, American Latinos have a heavy stake in the immigration debate and a vested interest in dispelling the misinformation that so often clouds public and policy debates. Latinos are the primary target of one of the most common anti-immigrant stereotypes in U.S. society: that of the immigrant who "steals" a job from a native-born worker, drives down wages, and contributes noting to the U.S. economy. Evidence challenges this stereotype. There is no correlation between immigration and unemployment. Immigrants and natives complement each other in the labor market rather than compete. 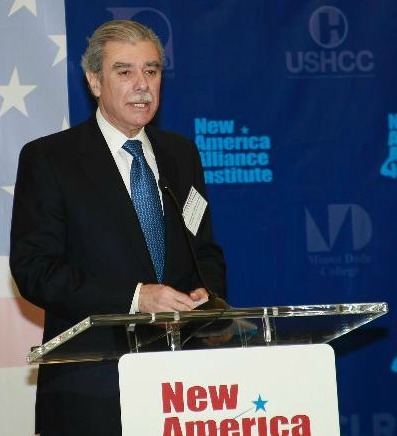 Immigrants create jobs in myriad ways, beginning with businesses' response to the presence of new workers and consumers by investing in new restaurants,stores,and production facilities. Immigrants and natives tend to have different levels of education,work in different occupations, and possess different skills, and the jobs they perform are frequently interdependent and complementary. This increases the productivity to which increases their wages. In addition, $1.2 trillion in Latino purchasing power, entrepreneurship and innovation also impact the growth of the U.S. job market and the economy. 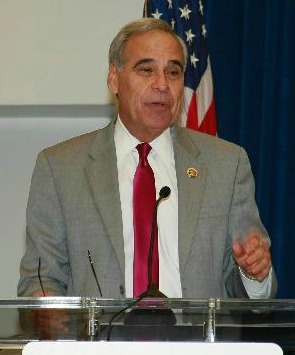 Remarks on behalf of President Barack H. Obama were given by The Honorable Charles A. Gonzalez, U.S. Representative of the 20th Congressional District of Texas, who was introduced by NAA Inc Chair of the Board The Honorable Roel C. Campos. The National Summit is not meant to be a single event, but another step in our collective continued efforts to improve the quality of life for all Americans. We invite you to stay connected to the NAA organization as we collectively do our part in advancing our communities and our country. Also, please be sure to mark your calendars for the 12th Annual Wall Street Summit taking place at the Waldorf=Astoria in New York City, November 14-16, 2012. We would like to thank our Co-Hosts, Sponsors, Media Partners, and Supporting Organizations for their collaboration and support. This summit can bring the North America and South America continents together which is very good thing and helpful one to the Latin people. I have downloaded the program guide of this summit from http://www.wizessay.com/dissertation/ blog. 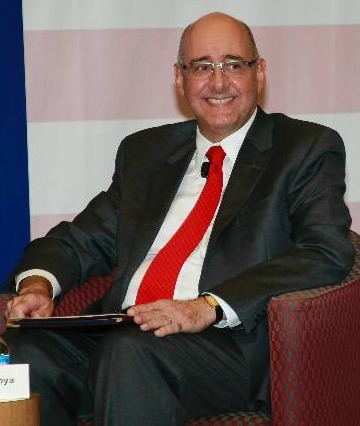 American company can now have look at investing in Latin American countries. This post is truly inspiring http://www.bestessaypoint.co.uk I like your post and everything you share with us is current and very informative,that you have done a fantastic job.